Happy birthday, to you American prince! Wow!His songs are wonderful, isn't it. Did you listen those. Iwish I had speak in french. I'm from Iran. A Persian. I just wanted to say that his songs inspired me to start to learn French. 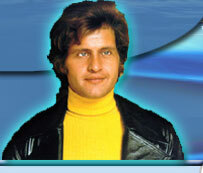 I agree with my Bulgarian colegue "I have listened to Joe Dassin's wonderful songs when I was a child". In Soviet Union Joe Dasin was one of non prohibited singers. I remember tragical day, then the Soviet Union TV, was said "The hearth of the Star of Joe Dasin leave's us". Joe songs lives with me. Now i started to learn france language, Joe songs helps me to do this. Your lyrics will always play. "Salut" is the most beautiful song of Joe's repertoire and of all french songs.He still lives in his two sons.